Glass Breaking Pliers for glass. Glass Breaking Pliers with movable, very stable forecastles. Very clean and carefully worked, in the head-area sharpened pliers. 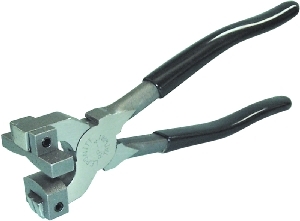 Glass Breaking Pliers with movable, very stable forecastles. Very clean and carefully worked, in the head-area sharpened pliers. For up to 8 mm glass. With wandered, plastic-coated grips. Provide clean, straight edges.